Many marketers talk about "category of one" brands, but most really don't know how to create them. To create a “category of one” brand, one must choose a preemptive frame of reference so that the brand is the only one in its consideration set. Rather than differentiating the brand by choosing a differentiating benefit within a current product/service category or frame of reference, one differentiates the brand by identifying or creating an entirely new product/service category or frame of reference that is highly compelling. 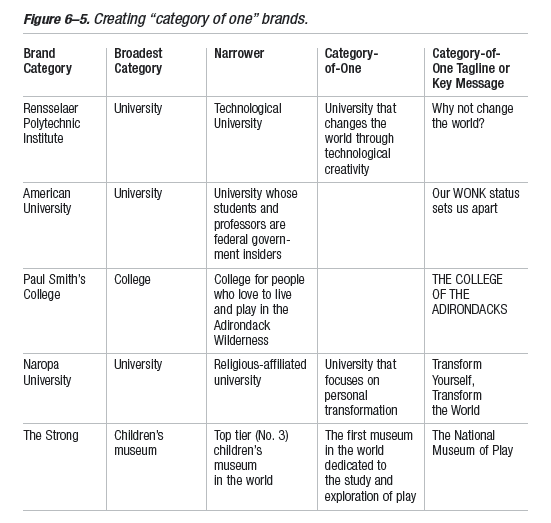 The new category is set up so that the brand in question is the only one within that category (Figure 6–5). Click here to order your copy of the book today.